Here, the nights seem so much longer than the days. Here, the things lurking in the shadows are less imaginary than you realize. Here are two cities divided, and look who just got caught in the middle. You will never be the Prince of the city, nor will you ever lead the Sabbat as the Archbishop. You will not be the alpha wolf. You will never become the Mayor of Minneapolis-Saint Paul. -- but you will be their pawns. Try as they might, the denizens of the World of Darkness cannot outrun the shadows lurking in the distance. They will never rise up to beat back their oppressors, nor will they subject others to their tyranny. -- but they will still try. This is a game fought, won, and lost by the pawns – the expendable fodder who demands more from life than they have been given, or perhaps even more than they deserve. Every piece serves a function no matter how short its time on the stage may be. 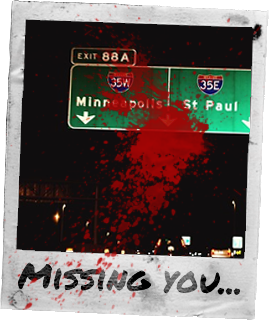 A Tale of Two Cities: Minnesota by Night is a mature intermediate to advanced literary role-play loosely based on White-Wolf's 'Vampire: the Masquerade' and 'Werewolf: the Apocalypse' story-telling games. We are set in present day Minneapolis - Saint Paul, Minnesota. We're still small, but we're active. Currently players can play as Vampires, Ghouls, Revenants, Garou, Kinfolk, Humans and Blood Dolls. We feature some house rules and boast a relaxed role-playing environment, with an emphasis on character-driven plots and development though there is an overall plot to the board as well.